An implant is composed of two parts that mimic a tooth's root and crown. 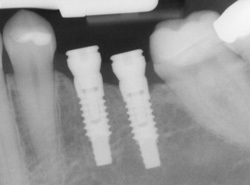 The implant itself is made of titanium and is surgically placed into the jawbone to act as a root. Once the implant is placed it fuses (or integrates) to the bone, a process that can take anywhere from three to six months. Then, a crown is attached to replace the top part of your tooth.